(Newser) – The worst flooding in the Balkans since the region was part of the Ottoman Empire has killed at least 37 people, forced thousands from their homes, and sparked fears that land mines from the conflicts of the 1990s could claim more lives. 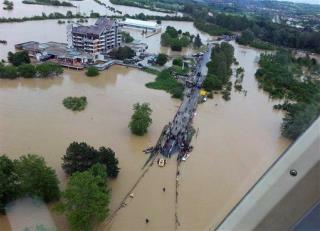 In Bosnia, landslides have buried houses, loosened land mines, and paralyzed large areas, reports ABC. "We are asking people not to panic if they see a shell lurking from the ground," says an official at a de-mining center. There are believed to be more than 200,000 land mines still buried in Bosnia, and the floods have moved warning signs from some areas, the Independent reports. Good old mankind, we can always find the money and labor to plant land mines but never seem to bother to find the time to clean them up. Wandering land mines. Whee. What fun. Given a certain assigned value to the meaning of the word "fun". Princess Diane was trying to clean these land mines but I guess that project died with her. Yugslavia should have stay together just like under Tito and they wouldn't have as many problems. Thanks to Saudi King, now they have plenty.